Whether it’s a dead battery, a flat tire or a flashing dashboard light, one thing is for sure: you have to be towed to the nearest repair shop. We pride ourselves in wrecker, towing service and we always work hard to ensure that we provide you the best customer service and experience. Looking for a reliable towing service? Then, you can count on us as we promise to be there as quickly as possible to get you where you need to go. When stranded on the roadside, finding the right assistance is very important. If you have run out of gas or fuel, finding someone to make a deliver is critical to your safety, Mechanical failure that requires towing JohnCo Wrecker & Towing Service of Ozona, TX is here to help! Accident recovery requires the right kind of equipment for both heavy duty and light duty. Quick response to your immediate need is a priority for us. Gene Cooper or Harold Thompson will assist you find the service required. Your safety is very important. If you are in an unsafe locations, please let us know. If we cannot service your request, we will help you. Our response will be speedy and courteous. If we cannot respond to you immediately, we will inform you up front. You will always know what the service will cost before we arrive. If we do not tell you the exact price, feel free to ask in advance. Thanks so much for contacting JohnCo Wrecker & Towing Service. These things happen at any given time and can leave you frustrated, especially when you have to be somewhere on time. If you need a tow, you can count on JohnCo Wrecker & Towing Service of Ozona, TX to ease your frustration and help you be on your way as soon as possible. 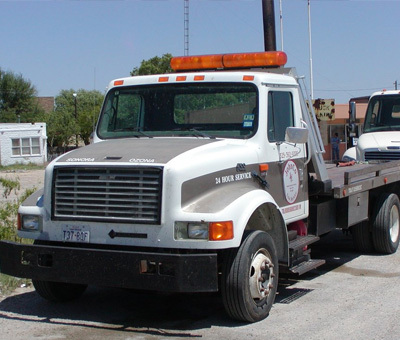 When you call JohnCo Wrecker & Towing Service of Ozona, TX, our automobile and truck towing service providers are immediately alerted to the issue and dispatched to your specific location to bring your vehicle in. Then, our professional technicians get to work and deliver the top-quality service you deserve to help you get back on the road. At JohnCo Wrecker & Towing Service of Ozona, TX, we understand how frustrating a vehicle breakdown can be, and that’s why we offer reasonable rates and quick response times unlike any other towing service on the market! “We were really up a creek with a burned out transmission on Easter Sunday. We got one quote for a borderline criminal price from one wrecker service, but after calling around, we found JohnCo. He gave us a quick response, a fair price, and a lot of good info about getting out situation handled. “Johnco is a wonderful towing company! Recently my mom and I were traveling from Ft. Hood to Balmorhea to see family and camp. (We were towing our pop-up camper) About 9 miles outside of Eldorado my transmission blew on my car. If you haven't been on this section of 190, there is nothing and little to no service. After being helped by someone passing by I was able to call a tow truck to take us to the closest mechanic that was open. (which was about 43 miles away in Ozona) Gene from Johnco showed up to tow us and our camper. He was so friendly and knowledgeable. Which was good because we were able to find out that the mechanic in Ozona wouldn't be able to help and we had to change our plans and be towed 54 miles north to San Angleo. Gene helped us find a car rental and a place that would be able to help us on a Saturday. He was so helpful and friendly. In an otherwise crappy situation, he really stood out as a highlight of our trip. You can count on us as we promise to be there as quickly as possible to get you where you need to go.